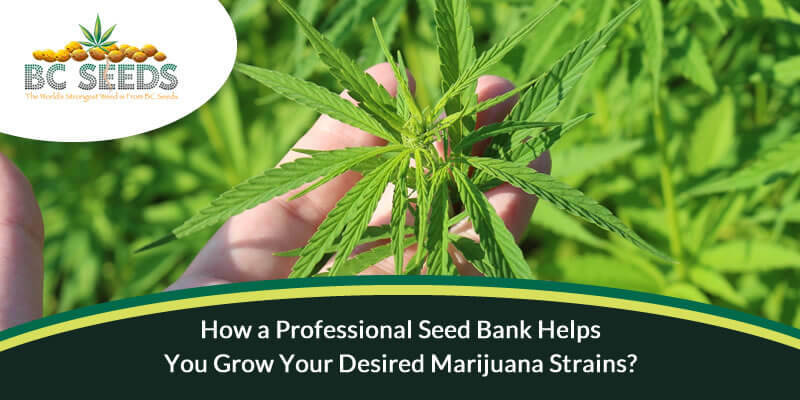 How a Professional Seed Bank Helps You Grow Your Desired Marijuana Strains? One way to always achieving a healthy marijuana plant with good qualities and a very high yield is by growing high- quality healthy strain seeds. Yes, other factors like climate conditions, lightning and adequate watering will also affect your plants out put to some certain degree, however, planting healthy strain seeds that have already been genetically edited and modified to produce optimally in your planting region will go a long way in boosting your final yield. And the best places to get these kinds of seeds are from a professional seed bank. Breeding your own marijuana seed strains can be disastrous and costly because it takes a lot of technicality and biological know hows to do. Seed banks on the other hand have the required level of resources and brain power needed to invest into research, testing and storage facilities in order to produce the optimal marijuana strain seeds that can help in maximizing yields for both commercial and individual growers. Seed banks are responsible for the improvement of old seed strains, breeding of new ones and the combination of different genes in plants in order to produce new seed strains with some certain characteristics that makes them more marketable. This way, seed banks are always helping create more diverse varieties of cannabis that can grow well in various conditions and are also best suited for certain specific situations while also eliminating undesirable traits, making it easy for you to find seed strains with the positive effects you want. Steps To Take To Find The Best Marijuana Seed Strains To Grow. Now you know the importance of getting your desired marijuana seed strains from a seed bank, it is time I took you on a step by step guide on how to ensure you pick the right strains from the right seller. Start with a simple list of all the characteristics, effects and use of the marijuana strain seeds you are looking for. Research on different breeders (seed banks) that offers the kind of strain seeds with the effects you are looking for. You can use the seed banks website for this research. Decide on weather you want you marijuana strain seeds to be regular or feminized. Decide if you are looking for an auto flowering strain seed or the regular one. By this time, the list should be small with only a few seed banks making it on. You then want to compare the results, prices, shipping policies from all the seed banks still on your list to find the best. Pick the one you like the most and place your marijuana strain seed order. You want to make sure you are ordering your marijuana strains seeds from a trusted breeder and not a new one as this adds a layer of security. Also note that established strains are believed to do better and are safer while you are still new and not familiar with how the plants will turn out. New strains might be less stable and could grow a lot different from the pictures and videos you found during your research.